Fig. 3.10. 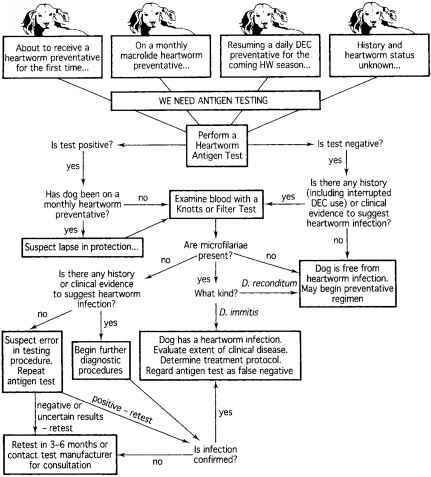 This algorithm shows the steps involved in screening dogs for canine heartworm infection. prepared two- or three-dimensional renderings of an object are often clearer than a photograph and thus preferable to it. The major advantage of drawings is that you can control the amount of precision while deleting extraneous details. Drawings also permit unique perspectives such as cutaway, blow-up, and exploded views. Several computer graphics packages are on the market. Some are very good, but there is a vast difference between creating artwork on a computer and creating it with pen and ink on paper. For some people, producing their own drawings is exhilarating. If you are not one of them, employ a graphic designer or professional artist. For best results, communicate carefully and allow sufficient lead-time for the project. 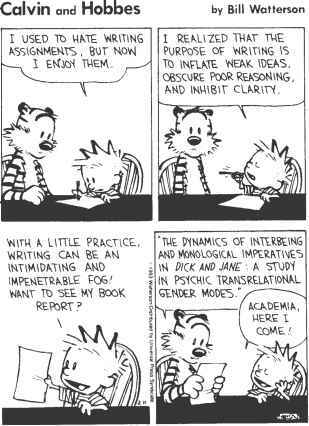 Remember that artists aren't technical experts. Sketch your ideas, explain your terms, provide correct spellings, and check everything carefully for errors during preparation of the artwork. Visuals must mesh with your text, like two gears that drive a machine. They must work in concert, each dependent on the other, to describe an object, a process, or a concept. Now that you've considered your choices and prepared a number of possible visual aids, it is time to reflect on some questions that concern them all.